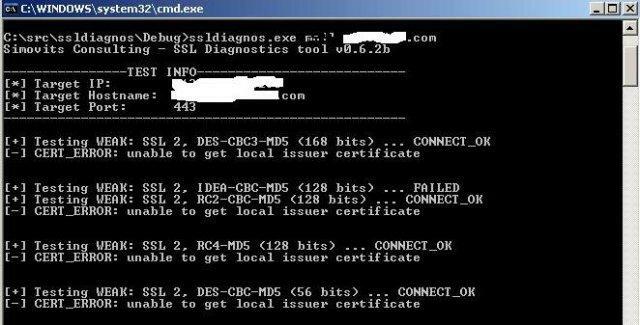 SSL Diagnos is used to get information about SSL protocols (pct, ssl2, ssl3, tls, dtls) and cipher suites. It can also be used for testing and rating ciphers on SSL clients. It has also specific support for pop3s, sip, smtp and explicit ftps. Tests renegotiation and availability of tls renegotiation extension. Example 2 – Test the host www.hostname.org using port 443 (which is the default). Also test send/receive. Example 3 – Test the host www.hostname.org using port 443 (which is the default). Connect-test only. Example 2 – Add a 500ms delay between tests.